Locally and nationally renowned artist Ed Trask has been transforming the south-facing side of a building on Center Street along the railroad tracks in Ashland. 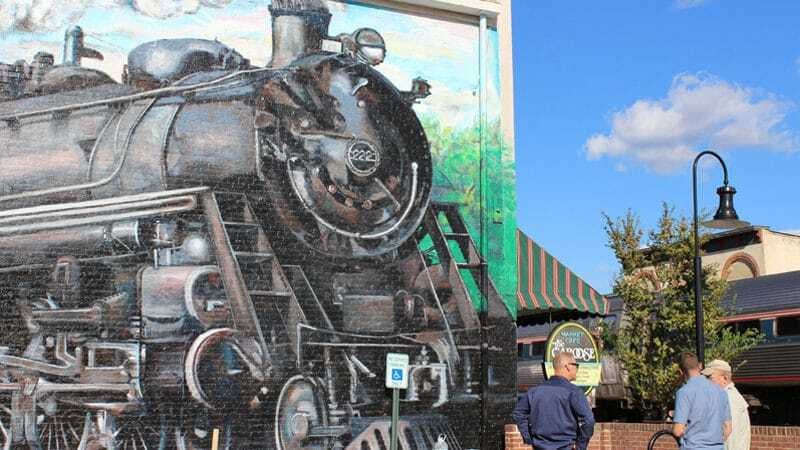 The large mural highlights a locomotive traveling through the town, passing the iconic town depot and pulling a string of railroad cars. The mural was originally the idea of Ashland businessman Art McKinney. After McKinney passed away in early 2016, two local organizations, the Friends of Art and Ashland Street Parties, took over the mission. Trask has impressed Richmonders with other area murals, including Hardywood Park Craft Brewery and Ellwood Thompson’s. As he worked on the massive piece this fall, he welcomed passersby who stopped to chat. “I’ve heard all sorts of stories from people,” Trask said, including many with family ties to the railroad. 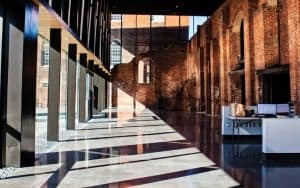 The art is “celebrating the community and celebrating the past of the community,” he added.